A good feng shui home is a home that looks good and feels good. Be sure any feng shui products you bring into your home contribute to its good energy and compliment the look and feel of your home. There are many different types of symbols and accessories that help cultivate good feng shui energy in the home, and there are no lack of locations at which to buy them. You can find legitimate feng shui items at places as unlikely as a home improvement center (bamboo stalks in the gardening section), as well as at specialty shops carrying a wide variety of unique Asian figurines and artwork. And of course, dozens of different commercial websites make just about every feng shui item easily available at a click of your finger. Finding truly good feng shui items is a little more challenging, since it is not the type of item that is most important, but rather that the item speaks to you in a personal way. This can be one challenge with buying items online, since it is often necessary to handle an item in person before you know if it is truly appropriate for your needs. Good feng shui products are easy to come by. Quite often products presented as feng shui products are of questionable quality and design. Learn how to define a good feng shui product and more importantly, where to buy good products. When looking for feng shui products for your home, the first challenge is just knowing what it is you need. What is it that you hope to achieve by displaying specific items? Feng shui practice traditionally catalogues many different items aimed at specific energy "cures," and it is important that you choose items that address definable needs. Second—and just as important—is to choose items that work with your home decor scheme and that resonate with you on a personal level. A feng shui product can be precisely the right cure for a specific energy need in your home, but if it does not appeal to you aesthetically and emotionally, it will create bad feng shui. Once your needs are defined, you will quickly find that good feng shui products are quite easy to find. Here are some common products that you might want for your home. A small fountain or other water feature is a classic feng shui "money cure," said to assist with prosperity and financial success. Decide on the location for the fountain—traditional spots are in the money area of a home, or in a specific room. In the classic school of feng shui, this is usually the southeast corner of the house or office space. Your chosen location will help you choose the ideal size, shape, and materials for your fountain. The fountain you choose should blend with the decor of the space and should please you personally. You can purchase good quality fountains at garden stores, new age bookstores, gift shops, and online retailers. Once you've decided on your fountain, follow traditional techniques for using a fountain to improve feng shui. Bamboo is considered a feng shui health cure at least in part because it is so easy to grow. A pot of feng shui bamboo is typically just an arrangement of stalks placed in a pot filled with pebbles or small stones and filled with water. And few feng shui items are easier to find. Numerous flower shops and nurseries carry lucky bamboo, naturally, but you can also find them at many Asian stores. The garden center in a home improvement center may offer pots of lucky bamboo. You may even find small lucky bamboo arrangements as gift items in grocery stores and novelty shops. If you do not like the typical lucky bamboo that is available in stores, you can easily create your own feng shui lucky bamboo. Flower shops carry bamboo stalks of different heights, and you can choose a small pot and you can arrange stalks as you choose, adding some small stones and filling the pot with water. As a spiritual practice originating in China, feng shui places special significance on images of the Buddha. Feng shui makes use of Buddha images in many forms including the sleeping Buddha, laughing Buddha, and meditating Buddha. 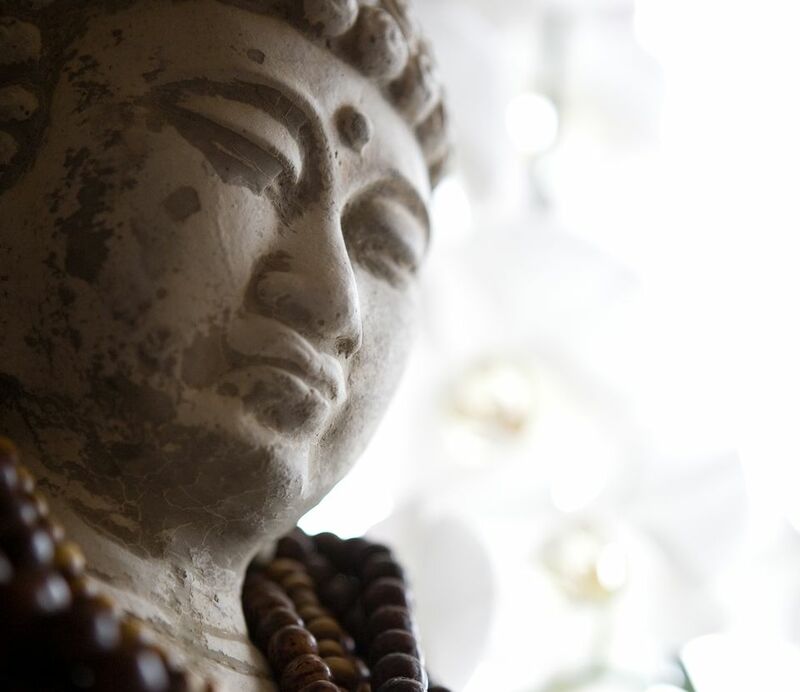 To choose the right Buddha accessory, match its form to the feng shui goal you have in mind. A laughing Buddha, for example, is considered a good symbol for the money/wealth area of your home. You can choose any of these forms in both figurines and two-dimension artwork. Buddha figurines and artwork are available in many home decor stores, new age shops, gift stores, and online retailers. Perhaps the best choice is a shop dedicated to genuine Chinese, Indian, or Tibetan items. A Buddha figurine is a highly personal choice, and items created by Asian artisans often resonate in a way that mass-produced commercial items can't. A variety of crystals that can be used for feng shui purposes. Crystals most commonly associated with feng shui are faceted lead crystals (Swarovski-type crystals). These can be purchased at bookstores and gift shops, as well as online. However, even more powerful are natural mineral crystals which can be found at online retailers, new age stores, and specialty shops. Natural crystals frequently used in feng shui practice include rose quartz (love and romance), hematite (energy grounding), tourmaline and obsidian (protection), and blue kyanite and citrine (purifying negative energy). Or, you can search for most items on Amazon.com. Another option is to visit a Chinatown in your city or state and find a home goods store there.